During the last two decades major advances have occurred in our understanding of lipoprotein metabolism in normal subjects, and patients with dyslipoproteinemias. Of particular interest has been the elucidation of the role of plasma apolipoproteins, lipoproteins receptors, transfer factors, and lipolytic enzymes in the metabolism of plasma lipoproteins. 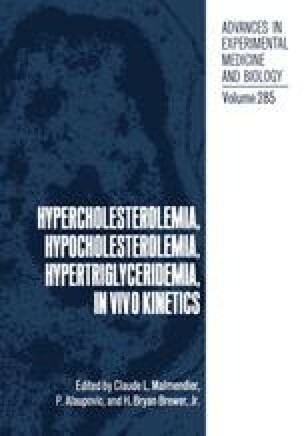 An improved understanding of the regulation of lipoprotein metabolism, and the intracellular as well as extracellular transport of cholesterol has permitted the determination of molecular defects in patients with dyslipoproteinemias. This new information has been used to development improved methods for diagnosis and treatment of patients at risk for the development of hyperlipidemia and premature cardiovascular disease. This report will summarize recent studies in our laboratory on three apolipoproteins, apoA-I, apoB, and Lp(a).